These five tools are useful no matter if you are stringing or doing bead weaving or wire work. You'll eventually need them all. While it is more fun to visit the craft store to pick supplies out in person you can also visit a number of online retailers to purchase good beginner crafting tools. All of the tools photographed in this article are from the Consumer Crafts Jewelry Tools section of their website. Wire cutters allow you to cut headpins, eye pins, and jewelry stringing wire. Always put the flat side of the cutters closest to the work for a closer cut. Don’t cut memory wire with your wire cutters though as it will put dents in your cutting edges making the wire cutters fairly useless. If you are going to be cutting memory wire I recommend buying ​memory wire cutters. Yes, there is a tool made specifically for cutting memory wire. Round nose pliers, as you can see, are rounded and perfect for making simple loops and other rounded wire elements. The jaws of round nose pliers taper towards the point which allows you to position your wire along the jaw to get the size of loop that you want. For a large loop place your wire near the handles and for a smaller loop place your wire towards the tip of the pliers. The key to making consistently sized loops it is to mark the pliers with a permanent marker so that you always place your wire in the same place. When you are finished with the project simply wipe the marker away with a bit of alcohol. Chain nose pliers are similar to round nose pliers except that the inside of the jaws is flat. They are better for gripping wire with their flat surface. I recommend chain nose pliers that are smooth on the inside so that they don’t mark your wire like the chain nose pliers with ridges do. Chain nose pliers are used for opening and closing jump rings or for the gripping wire. Like round nose pliers, they taper towards the tip, which makes them useful for getting into small spaces. Flat Nose Pliers are similar to chain nose pliers but the jaws do not taper towards the tip. This wider surface makes it easier to grip jewelry wire. 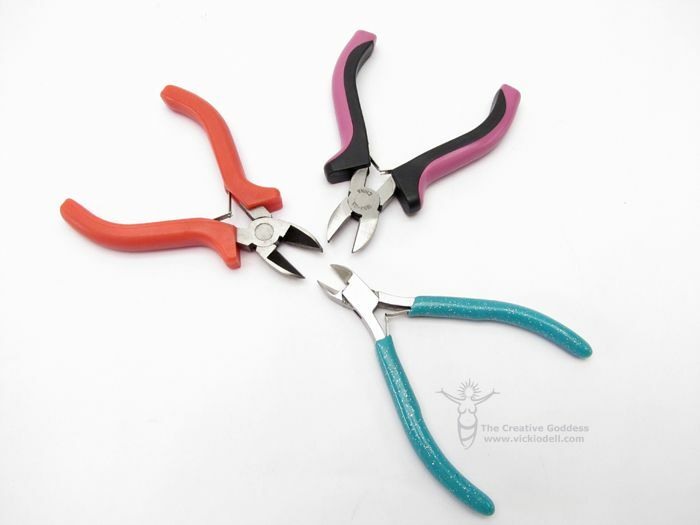 Flat nose pliers may not be as essential to a basic jewelry making toolbox as chain nose pliers but you WILL need a second pair of flat nose type pliers for holding wire while you shape it. You’ll either need two pairs of chain nose pliers OR a pair of chain nose pliers AND a pair of flat nose pliers. Also called Crimpers and Crimping Pliers this tool is used with crimp beads or crimp tubes to secure a clasp on the end of beading wire or to keep beads in position on projects where the wire shows between beaded segments (ie an “illusion” necklace). The crimp tool has two notches in the jaws. Use the first notch nearest the handles to slightly flatten and round your crimp bead onto the wire. This turns it into a ‘C’ shape (ideally with one piece of wire on each side of the ‘C’). Then use the notch near the end of the pliers to shape this ‘C’ shaped bead into a round. You may have seen some jewelry makers use flat nose or chain nose pliers to smash the crimp bead or tube flat onto the jewelry wire. This is not a process I teach or recommend and I’m kind of a stickler about it. Smashing the metal creates a sharp edge that is 1) NOT pretty and 2) NOT comfortable on your delicate skin. If you have it in your budget when you are setting up your basic jewelry making tools, and you plan on stringing beads, I would strongly suggest a few Bead Stoppers. They are the simplest little gadgets but can save you TONS of time. All you do is squeeze the little loops on either end, spreading the springs apart, then insert your bead wire and release the loops. The bead stop stays on the wire keeping your beads in place. There is nothing like picking up one end of the project you are working on and having the beads slide right off the other end.